This documentation may be revised in response to updated annotation guidelines and addition of new enhancements to the curation tools. 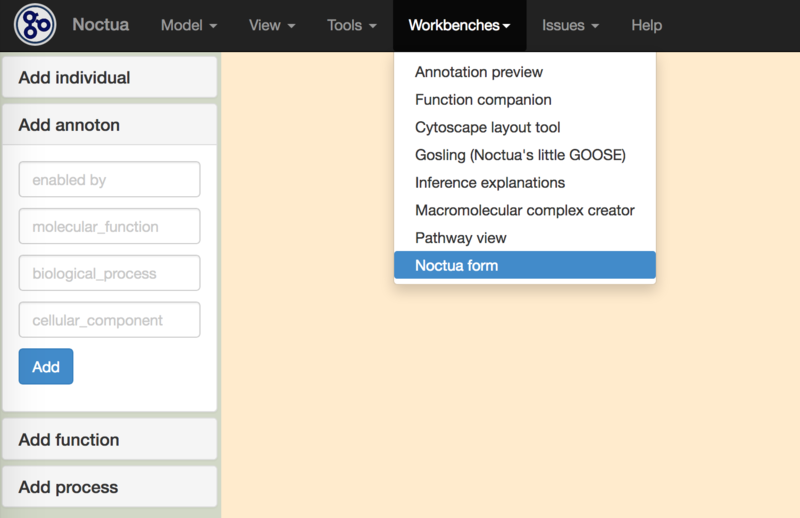 Feedback is welcome; please add suggestions to the go-annotation or go-noctua github trackers for questions about modeling or the curation tool, respectively. One major difference between simple annotations and GO-CAM models is that the former does not have explicit relations between the gene product being annotated and the GO term. 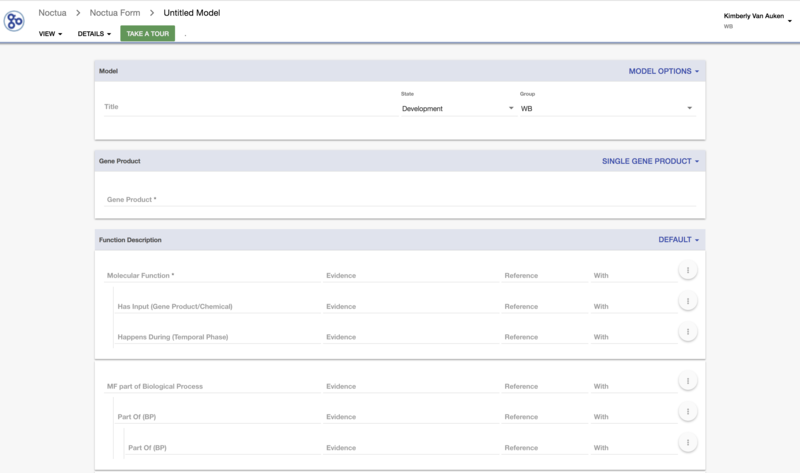 In GO-CAM models, using defined, semantic relations allows us to capture how a gene product’s molecular function relates to other aspects of GO. GO-CAM explicitly defines the relationships between: 1) different aspects (MF, BP, CC) of each gene product as defined in GO, 2) the combined functions of different gene products (“pathways”), and 3) different systems of interacting functions (“modules”). The Default template can also be used to annotate combinations of MF, BP, and CC, but the curator must always enter an MF annotation and understand that they are making explicit statements about the relationship between that activity and the BP and CC, i.e. the MF is an integral 'part of' the BP or the MF 'occurs in' the CC. If you're not sure that this is the statement you want to make, you can use the BP only or CC only forms to make your annotations. By default, the form allows you to enter a single gene product. Start typing, choices will appear, and then select the gene product. 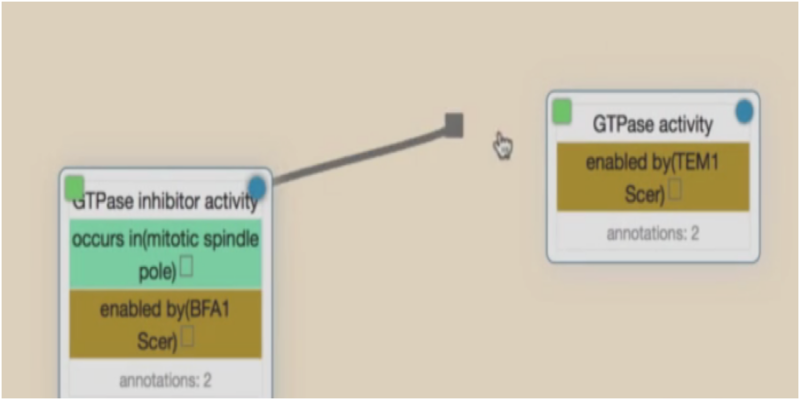 If the Molecular Function is unknown, but you are also making a Biological Process annotation, enter "molecular_function" and the same evidence and reference as the Biological Process annotation. If the Molecular Function is unknown, and there is no evidence for what the Molecular Function might be, enter "molecular_function" and the ND evidence code. Press the CREATE button. A new activity will appear on the graph canvas (the main window). 2. If the CREATE button is grayed-out, there is some information missing from the form that you still need to fill in. You can press the "why is the save button disabled?" for a list of missing fields. Fig. 3 Making causal relations between activities. In these cases, link the upstream activity (e.g. RNA polymerase II transcription factor activity, sequence-specific DNA binding, (GO:0000981)) to the mediating process (e.g. positive regulation of transcription by RNA polymerase II (GO:00045944)) with part of, and the mediating process (e.g. positive regulation of transcription by RNA polymerase II promoter (GO:00045944)) to the downstream activity (the activity of the transcribed gene product) with causally upstream of, positive effect. The equivalent model would be made if the transcription factor activity negatively regulated transcription by using the appropriate GO Biological Process term and the "casually upstream of, negative effect" relation between the transcription BP term and the downstream target.